The trouble started just after the last update of our Slow & Steady passive portfolio . We took a hit in October, staggered on through November, then went down like a sack in December. News reports made the market turmoil sound like the Charge of the Light Brigade. The result of this butchery? Our passive portfolio turned in its worst ever annual performance. We were down 3% on the year. Quick, send in the trauma counsellors! As a rule of thumb , we should expect our equities to be down one in every three New Year Eves. Sure, 2017 was all champagne corks and 2018 was nose pegs – but this is situation normal. The fact is we’ve had an easy ride since the Global Financial Crisis. This is only the second negative year recorded by the Slow & Steady portfolio since its debut eight years ago. We’re still growing at 7.95% annualised and we’ve yet to take anything worse than a noogie from the market. The Slow and Steady portfolio is Monevator’s model passive investing  portfolio. It was set up at the start of 2011 with £3,000. An extra £955 is invested every quarter into a diversified set of index funds, tilted towards equities. You can read the origin story  and catch up on all the previous passive portfolio posts . It’s always salutary to see how diversification dilutes the pain. This time our global property and UK government bond funds closed the year in positive territory – just. That salved our portfolio from the deeper cuts borne by emerging markets, UK equities, and global small caps. They’re showing annual losses of around minus 10% at the time of writing. Diversification doesn’t always work immediately – sometimes it doesn’t work at all – but our bonds take the edge off more often than not. If you’ve been chewing your fingernails over the last three months, upping your bonds is the answer. Read up on risk tolerance . As it is, the Monevator reader ranks seem to be holding the line and dreaming of cheap equities. Elsewhere, the doom-mongers hold court. We’re at the mercy of Brexit, Trump’s next tweet, the Fed turning the interest rate screw. Take your pick. A couple of those woes illustrate why you can’t profit from prophets. Does anyone know how Brexit will end? No. Does anyone know what Trump will do next? No. Even he doesn’t know. Moving on, it’s annual portfolio service time. Our plan commits us to reducing equity exposure as our investing clock runs down. Every year we move 2% from the risky equities side to the defensive bond side of our portfolio. This is conventional and sensible risk management . As we age, we have less time to recover from a market-quake. More wealth in bonds means more wealth in recession-resistant assets. Our asset allocation is now 64:36 equities vs bonds, very close to the classic 60:40 mix. The portfolio started on 80:20 back in 2011, when we had little to lose and two decades stretching ahead. With 12 years to go it’s still a pro-growth portfolio, but with plenty of padding should markets crash. So this time around we just shave 1% from a couple of our spicier asset classes and buy more bonds, right? Firstly, our equity diversifiers (global small cap and property) are set at 10% of our total equities allocation. 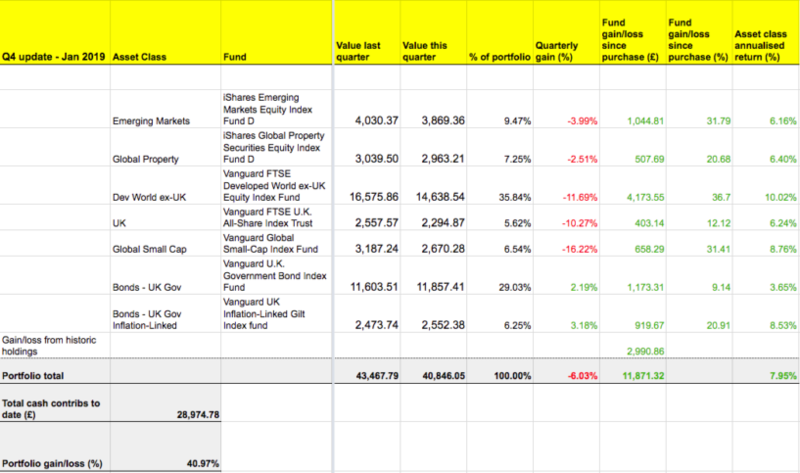 Meanwhile our equities allocation downsized from 66% to 64% of our portfolio pie. The effect on global small cap was: 10% x 64% = 6.4% total allocation. Decimal points have no place in asset allocation but now we’re rounding down not up. Hence global small cap and global property got 1% sliced off. Ideally we’d end it there, but we also try to keep our main equity holdings in line with global market allocations. Star Capital helps us do that with their regular updates on the weights of world stock markets . The UK’s share of global markets was about 5% (from around 8% in 2o11, incidentally, economic decline fans). That translates to a 3% share of our equity allocation. However there’s little point to sub-5% holdings in relatively small portfolios – it just doesn’t make enough difference. Instead we’ll reduce the UK to 5% of our overall portfolio and that will be our bottom line. This makes us overweight UK (crack open the Union Jack underpants) but we’ll let that pass – the UK market seems quite cheap and it’s our home currency, for better or worse. We should have knocked back emerging markets, too. They’ve had a rough year and their wedge is smaller now. But emerging economies themselves are under-represented by the capital markets and valuations are favourable, so we’ll hold our overall allocation at 10%. Finally, I’m now broadcasting from the outer reaches of interest but if anyone wants to know why I’ve trimmed our UK inflation-linked government bonds then it’s because the available linker funds  have structural issues. The short version is there’s mucho interest rate risk embedded in these products. We only carry them as a diversifier and I’d prefer to do that at the minimum practical level of 5%. You can see how even a committed passive investor like myself needs to make all kinds of judgement calls. It’s hardly day-trading, but it isn’t pure mathematics, either. In my view, rules only fit reality if you bend them a bit. There’s no guarantee that any of my tilts will play out better than buying an all-in-one, Vanguard LifeStrategy fund – but this kind of portfolio maintenance only takes a few hours a year. And I like being invested in my investments. Now we need to face one more fact of life – inflation . Each year we adjust our regular contributions by the Office for National Statistics’ RPI inflation report. This tells us we have to find another 3.2% this year to ensure our plan keeps pace with the cost of living. In 2011 we were investing £750 every quarter. That had ballooned to £935 by 2018. That’s £955 in 2019 money. This model portfolio is notionally held with Cavendish Online. Take a look at our online broker table  for other good platform options. Look at flat fee brokers if your ISA portfolio is worth substantially more than £25,000. The Slow & Steady portfolio is now worth over £41,000 but the fee saving isn’t juicy enough  for us to push the button on the move yet.